My Irish Father’s Authentic Italian Grandmother "Gravy". Most of my family’s secret recipes are actually from the back of the box one of the ingredients came in. Sure, at one point in time, they may have been written down by someone and are then more easily passable as a ‘family recipe’, but by and large, most of them came from helpful recipe suggestions on the box. One exception to this is my father’s spaghetti sauce. The story goes that home sick from work one day, he found himself watching a talk show on tv, with Frankie Avalon, who gave out his mother’s recipe for meat sauce. My father decided it sounded easy enough, and authentic Italian food fan that he was, decided to give it a whirl. It became a family favorite. 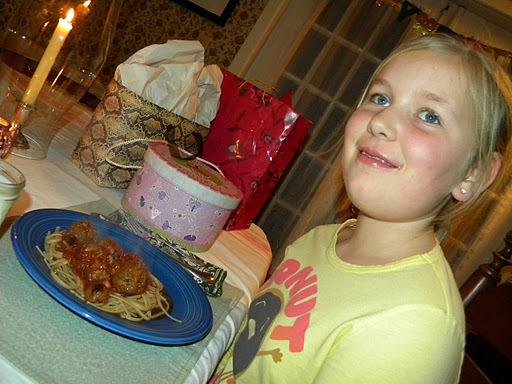 Edie requested it for her birthday – I think her main motivator was all the meat involved, although she also loved telling everyone that I was making what she calls “Granddad Bob’s Spaghetti Sauce” and I got that for her, it was a connection to a grandfather she will never meet. I don’t really begin to know how to approach the subject of my father with her. He passed away long before she was born. For years after his death, there was no speaking of him within my family. I have a tendency to block unpleasant memories, of which there were many, but in not being able to properly mourn him out loud, I’m afraid many of my good memories were lost too. I don’t have too many people I can talk to and share the good memories with. As Edie gets older, I realize she wants to hear them, I know she needs to hear them. The subject of my family is so loaded. She can’t quite wrap her head around why we don’t talk to my mother and my siblings and I don’t expect her to ever fully understand it. It’s not something most people understand – even I, who have lived through it, wonder if I made it all up. Pat assures me, I haven’t. So, my father. His father was a coal miner’s son from a holler in West Virginia, who joined the Navy during World War II. He got stationed off the coast of Boston and met my grandmother, who’s parents were off the boat from Ireland. They met, got married and had my father. After the war, they moved back to the holler, where my father’s younger brother was born on the kitchen table. (My father never failed to mention this fact about his brother.) After a mine cave-in, where my grandfather was gravely injured, they packed up and moved to Baltimore, where a job in a factory was far more appealing than the coal mines. My father used to tell us to never forget our ‘hillbilly roots’ as he called them, taking us to visit his aunts, uncles and cousins in the holler, but also making sure we lived a life much different. My parents went to grade school together, at the Catholic school behind the house my mother’s parents would own by the time I came along. I think they were in the same first grade class, but my father got “hung up in 10th grade” as he put it. I never got the full story on exactly what that meant, but I know he was just a few months younger than my mother and graduated high school a full two years after she did. He managed to work his way up to what I think was middle management in a fairly big internationally known corporation by the time he passed away, without the benefit of a college degree, something probably unheard of in this day and age. He was also in the National Guard, and there worked his way up to company commander of a special forces unit. He had his 25 years in and was set to retire as a colonel when he passed away of a heart attack at the age of 44. He was the one that made me start volunteering at the local hospital when I was 14, get a job when I turned 16, and insisted that at least half of all my babysitting money go into a savings account. He was a sucker for buying me things I wanted – I learned early on that if I could get him to go shopping with me, he’d buy it for me. He dreamed of being a ‘gentleman farmer’ and for a time when I was young, we lived on a farm, where he tried out the dream. I have fond memories of those adventures (and adventures they were). He would try just about anything once, he loved a good prank and was all about throwing the plan out the window and doing things spur of the moment. He made me watch “Gone with the Wind” because he felt it was one of the greatest movies ever made. He also thought that about “The Longest Day” and “Animal House”. John Wayne was the last great movie star according to my father. I remember him telling me exactly why he voted for John Anderson in the 1980 election, although I don’t remember the reasons anymore. He loved this country. To this day, I’m not sure I’ve ever met anyone more patriotic than my father. Our quality time together every day was watching the evening news with Walter Cronkite. When Dan Rather took over, we switched to another network, because he just didn’t trust him. On weekends when we would watch tv, he made a game out of guessing the prices of what is now those “Seen on TV” ads. Remember how they’d show you all the stuff you’d get if you would only order now, but would put off giving the price until the very end? (“But that’s not all, if you order now, we’ll throw in this free set of Ginsu knives!”) He made a game of that – What would the price be? What else were they going to throw in? He loved to go to Kmart and just hang out for those blue light specials. If you went there with him and lost him, all you had to do was wait for the next “Attention Kmart shoppers, there is a blue light special in Aisle 6” and you could go find him. He picked up a Weber grill, off season, for a song on one of those, another time, it was accessories to go with his grill. The night he brought the grill home, it snowed. He grilled out anyway. He would spend his lunch hour walking to the thrift stores downtown, finding treasures. We had one phone, an old rotary phone, on the wall, in the kitchen. If he was home, he was the one to answer it. Rare was the standard “Hello”. He had a sense of humor, so often the phone would be answered in some way that if you didn’t know it was our house, there would be a hang up. If you called back, you got the exact same greeting. “City Morgue, you stab ’em, we slab ’em” was a favorite, “City Zoo, Monkey House” was another. There were quite a few. He expected our friends to talk to him, if they didn’t, then they couldn’t talk to us. God forbid a boy should call, because they would be detained for a good 10 minutes before my father would hand the phone off. I recall one boy coming to pick me up for a date one evening and when my father answered the door, he realized he had grown up with the boy’s uncles and slammed the door in his face, saying no daughter of his was going out with someone from that family. Somehow, the boy managed to knock again, my father opened the door and told him he could take me out, but he was to have me home by dark. A few years ago, I happened upon an article in Cook’s Illustrated about the perfect spaghetti sauce, what Italian Americans call “gravy”. I recognized my father’s sauce. My hillbilly, Irish father, who learned how to make this sauce from a tv show. Which is funny, because a good bit of how I learned to cook was from watching shows on tv. I have alot of my father in me, as does my daughter. She has his weird ‘duck feet’, where her second and third toes are fused together a little higher than the rest of us. She has his sense of humor, definitely. And just like him, she walks around singing “cha cha cha”, tacking it on to just about every song and saying you can imagine. It’s amazing what comes through in our DNA. The sauce – it’s heavy on the meat, and I don’t really care much for meat to be honest. I don’t like touching it when it’s raw, I don’t like the texture and most of the time, I don’t like the flavor. Somehow, I ended up with a daughter who is a self described ‘meatatarian’, who thinks that vegetarians are crazy. Vegans? Whoa. That’s just….wrong. I like to throw some veggies in just for kicks – she claims that tomatoes are vegetables enough, but knowing how she loves carrots, I get away with adding them. Mushrooms, she’s realized I adore and put in everything, so she’s just going to have to learn to eat around them until she can fend for herself. I cook the pork and sausage in another pan, to cut down on some of the fat. Pat & Edie tell me I’m cutting out some of the flavor by taking out some of the fat, but frankly, I don’t care. I have put my father’s recipe first, with my substitutions and additions after. In large pot, place olive oil to cover the bottom of pan. Bring up to temperature and add minced garlic, and country style pork ribs. Brown ribs on both sides. Add 3 large cans of tomato sauce and bring to a slight boil. Cut Italian sausage into bite size pieces and add to mixture. Add prepared meat balls, a few teaspoons of basil, oregano & Parmesan cheese. Bring to a slight boil and cook on low heat for several hours. I like for the pork to be falling off the bones when I serve it. I seem to recall he used at least a pound each of the ribs & sausage. Meatballs – Equal parts ground pork, veal & beef, sometimes known as ‘meatleaf blend’. Add one egg, a tablespoon of parsley, Italian bread crumbs and salt & pepper to taste. Roll into balls, about 1 inch in diameter and roll in Italian breadcrumbs. My version – I throw in onions, carrots & bell peppers with the garlic. After they soften, I add mushrooms and some wine. When those are cooked, I add the tomatoes and the prebrowned pork & sausage. I use chopped tomatoes I can from the garden and I find I usually add an extra jar. I add a 1/2 cup of pesto instead of basil and after bringing to a boil with the addition of the meatballs, I add a 6 oz can of tomato paste. Oh, and the meatballs – it’s hard to find ground veal, so I skip that. I used fresh sausage my last go round. I remember my father swearing that if you wanted a good dinner on Saturday, you started this sauce on Thursday. I concur – always start it a day ahead of time, as it really improves with age. It freezes well and will feed an army for days. I think I got 12 servings out of the last pot I made. Serve with pasta, garlic bread and a nice salad. My meatatarian, so happy with her birthday dinner. The Sisterhood of the Bromance and other adventures from our weekend. I love the stories about your father (and his history). They also reminded me so much of my own family's past (he sounds a lot like both of my parents, both also deceased unfortunately). I also had to smile at your sentence about it being amazing what comes through DNA. Absolutely true! He sounds wonderful–and of a time when men were of a certain quality. What is it about food, family and memories? When I used to teach, I would assign my students to gather 5 family recipes and a story about the importance of each one. I cannot recall any kid never finishing that assignment.